With so much to see and do in every corner of the city, transport is an essential part of your London adventure. One of the easiest and cheapest ways to travel is with an Oyster card, which can be used on the capital's buses, trams, and Tube. Oyster cards can also be used to pay for journeys on the DLR, London Overground, TfL Rail, Emirates Air Line, the River Bus and most National Rail services within the city. In short, an Oyster card gives you full access to all of London's diverse public transport options. An Oyster card is an electronic plastic smartcard that can be loaded with pay-as-you-go transport credit. 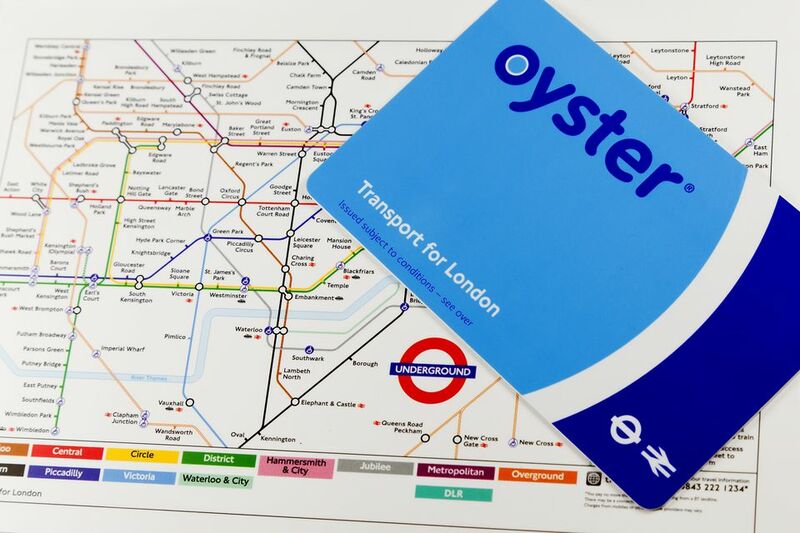 There are two options available to tourists: the regular Oyster card used by London natives, and the Visitor Oyster card, which is specially designed for use on one-off trips. Both cards work in conjunction with the yellow card readers installed at all transport stations, calculate the cheapest possible fare for each journey and offer a daily capped rate that makes unlimited travel affordable. Both versions of the Oyster card are significantly cheaper than traditional paper Travelcards. For example, travel within transport Zones 1 and 2 is capped at a daily maximum of £6.60 with an Oyster card, while a Day Travelcard for the same zones costs £12.30. At the end of your trip, you can request a refund of any unused credit, or give your Oyster card to a friend or family member. Pay-as-you-go credit on both cards is fully transferable and never expires. If you're traveling to London for a short visit, a Visitor Oyster card is probably the most convenient choice. You can order one online ahead of your trip, and have it delivered to your home so that when you arrive in London, you don't have to waste time queuing to purchase a regular Oyster card. This is especially helpful if your flight arrives at Gatwick Airport, as all Oyster cards can be used on the trains from the airport to central London. Visitor Oyster cards cost £5 (plus postage), and can be pre-loaded with credit options ranging from £10 to £50. If you run out of credit during your visit, you can load more money onto your Oyster at any Oyster Ticket Shop (of which there are more than 4,000 across London) or TfL Visitor Centre. It's also possible to load credit at any Tube, London Overground or TfL Rail station, and at several National Rail stations. Visitor Oyster cards are only compatible with pay-as-you-go credit and cannot be loaded with multi-day travelcards or passes in the way that regular Oyster cards can. However, a major advantage of this card is the special offers and discounts it offers at selected restaurants, shops, galleries, and entertainment venues. For long-term visitors, a regular Oyster card could be the more cost-effective option. These cards can only be purchased upon arrival, from Oyster Ticket Shops, TfL Visitor Centres and most London Tube and rail stations. They cost £5 (refundable at the end of your trip) and can be loaded with any amount of pay-as-you-go credit. Unlike Visitor Oyster cards, this option can also be loaded with multi-day travelcards that give even cheaper fares for longer stays; or with discount cards including Bus & Tram Passes and National Railcards. Remember that only pay-as-you-go credit can be used by someone else after you leave. Regular Oyster cards are compatible with the TFL Oyster App, and can be registered with a contactless and Oyster account. The latter allows you to easily see how much credit you have left, to view your journey history and to apply for refunds online. If neither Oyster card option sounds like a good fit for you, there are alternative ways to pay for transport in London. Although they don't offer the same discounts, paper Day Travelcards may appeal to those that prefer to keep things traditional. This ticket allows for unlimited travel within a 24-hour period on the bus, Tube, DLR, tram, London Overground, and most National Rail services within London. Discounts are also available to Day Travelcard holders wishing to make use of the Thames Clippers River Bus and the Emirates Air Line cable car. For the more tech-savvy, contactless cards allow you to pay for journeys of £30 or less by touching the card to the same yellow card readers used for Oyster payments. The benefits of contactless payments over Oyster cards include not having to worry about running out of credit or queuing to top up your Oyster when your credit is running low. Contactless payments on the same card are automatically capped on a daily and weekly basis, so you'll still benefit from reduced fares. However, if your card is issued outside the UK, you may have to pay overseas bank charges. Similarly, while American Express contactless cards and nearly all Mastercard or Maestro cards are accepted, some other foreign cards may not work on the London transit system. The same issues apply to those intending on using Apple Pay. Check with your card issuer in advance to find out whether your card is compatible, and what charges you may incur by using your card overseas. Should I Buy an Oyster Card for My Children?